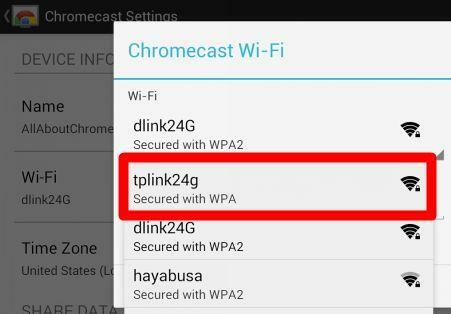 If you have two WiFi networks at home for different purposes, for example, one for normal usage, and the other connecting to a VPN server, you may sometimes want to switch Chromecast WiFi network. This tutorial will show you how to change Chromecast WiFi network if you have more than one WiFi network at home. Please note, this tutorial assumes you can access both WiFi networks. If you no longer have the access to the old network, you have to reset your Chromecast as shown in this tutorial. Chromecast can only remember one network at any time. Changing Chromecast WiFi network means that the old network info will be deleted from Chromecast device. 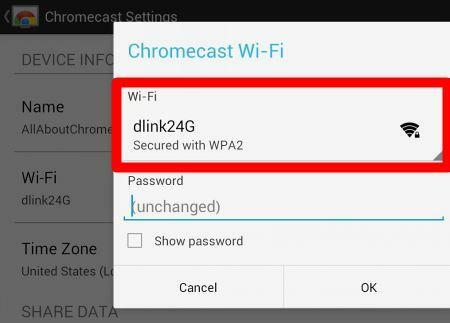 Chromecast can only access 2.4GHz WiFi network. But your mobile devices or PCs that are on 5GHZ network or on Ethernet can still find and connect to this Chromecast device, as long as your devices and Chromecast are connecting to the same router. In this tutorial, we will use an Android device (iPhone or iPad works in the similar way). 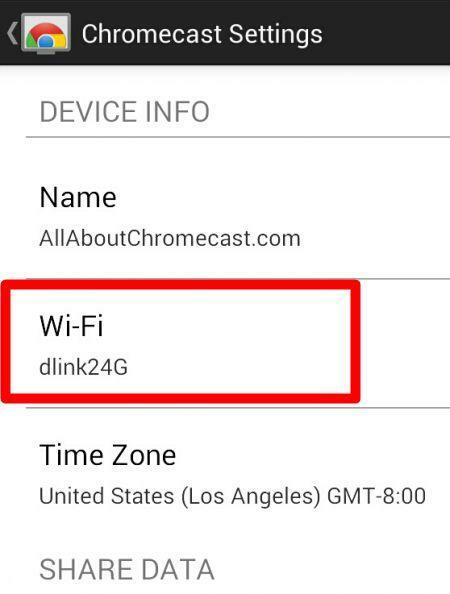 The Chromecast WiFi network will be changed from “dlink24g” to “tplink24g” . To change Chromecast WiFi network, Chromecast must be on and connected to a WiFi network. If you do not want to watch the changes on TV (you can always see it on your mobile devices), you do NOT need to power on the TV. To manage the WiFi network for Chromecast devices from a mobile device, you have to start Chromecast App in your mobile device. Once the Chromecast App is started, your mobile device will search for any Chromecast devices in the same network in range. The discovered Chromecast devices will be listed once the search is over as shown below. In the devices page, tap the Chromecast device to connect the mobile device to this Chromecast device. Now, the device is connected to dlink24G. 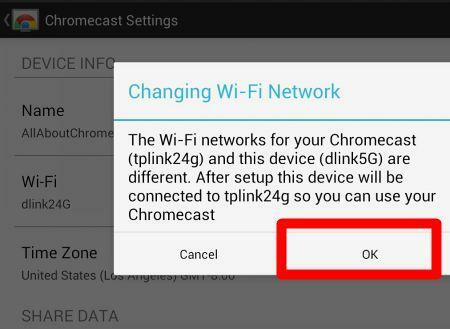 To change Chromecast WiFi network, simply tap the network entry as shown above. This will brings a popup window showing current network info. Tap the current WiFi network info as shown above, you will get the list of WiFi networks in range (discovered by your Chromecast device). Tap on the new WiFi network you want to use. Provide the password for that WiFi network. Tap OK to change Chromecast WiFi network. Now you will get a warning message. It tells you that if you tap OK, your Chormecast device and your mobile device will be not in the same network. The Chromecast App on your mobile device will automatically switch your mobile device’s WiFi network to the same network as Chromecast. In other words, your mobile device will change WiFi network automatically after you change Chromecast WiFi network. Of course, if the password of the new network is not saved in your mobile devices, the connection will fail. You can also manually change the WiFi network in your mobile device. Please check the user manual of your device. After tapping OK, the Chromecast device will try to connect to the new WiFi network. Now you finish to change the Chromecast WiFi network. If both of your mobile device and Chromecast connect to the new network successfully, you will be able to find in the devices page as shown below. This means you successfully changed Chromecast WiFi network. You can now stream contents to your TV from this new network. Do you have any problems to change Chromecast WiFi network? Please let us know in the comment box below. For more Chromecast tutorial, you may check our Chromecast how-to guide page. The device worked until we installed u-verse recently, but I can’t change inputs. When I try, I’m prompted to open the chrome cast app.. This starts the connection process with no options except “continue” and “cancel” The only option results in another long fruitless search for the device which is plugged in and blinking, but inoperative.. Is there any other way to change inputs? It is not clear how you configure your system. How did you connect Chromecast to the TV? If you connected t=it to TV HDMI port, you can change the source/input of TV. What is your network configuration? Is your PC or mobile device connected to the same wireless router? What is the settings of your wireless network? Chromecast only uses 2.4G Hz wifi. How can a connect my chromecast when it only recognized a wifi who’s router was fried in an electric storm & replaced with a different combination router/modem? What’s shown on the TV screen? What’s the color of the led in the chromecast? My Chromecast was working fine for my Wireless Network/Laptop. I changed the wireless network while giving a demo at my friends place using his laptop. Now the issue I can setup the device only using my friends Laptop lime its tagged to it. I can see my chromecast but cannot set it up using my Laptop( and my network. I have tried resetting the device but still same issue. Not sure if I am missing something here or just a silly mistake from my side. Whenever you change the network, you need a factory data reset. If the reset is successful, it should ask you to set it up when you plug it in tv as indicated on the TV. For your case, you may try to clear the cache for Chrome browser. If necessary, you can also remove the Google cast extension, relaunch chrome, then add the Extension back again. I changed ISPs from Comcast to Frontier, updated Chromecast settings (wifi ID and password) but it does not connect. It says “Something went wrong” and to check to network settings and try again. I’ve checked and double check the wifi id and password. Still no luck…any ideas? How did you update wifi id and password for chromecast? You need a factory reset for the Chromecast to update the network info more. You may try to reset the chromecast and set it as a new Chromecast cast. The error message usually means no internet connection. My chromecast was working fine until, I added a password to my wifi. Now, it tells me that it cannot connect after I add the correct password. Can anyone help me? After resetting the Chromecast, you can set it up again as a new one. What’s exactly shown on the TV screen? Did you finish the setup before? 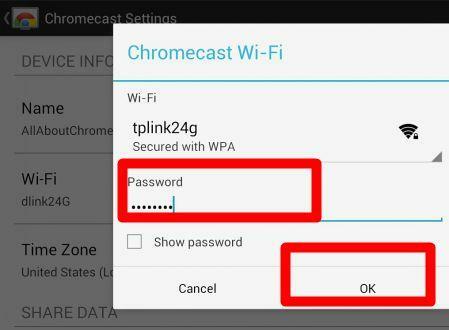 Chromecast app on phone will not recognize password for my Wi-Fi. It is all correct. What do I do now? Chromecast saves the password and other network info on the device directly. The Chromecast app doesn’t provide password for the device. I am trying to change my chromecast setting from the lower setting to the higher one. We were unable to do that when we installed it and the lower setting is stopping when watching a movie. It didn’t go the way the the tutorial said and I may have deleted the chrome cast from my iPad. I have it on my apple lap top. HELP!!! I am not technically savey. Thanks. Please note, this is a community site, not Google’s support forum. I am not sure about what you are talking about. Chromecast settings (only network info and name) are saved in the Chromecast device only. Nothing is saved in your ipad. Any devices in the same network can control or use the Chromecast device. When I set it up the ChromeCast worked fine and I was able to connect to it via my Andriod mobile, laptop and Desktop, but once I switched off all, and in morning it keeps saying “Connected to dlink (wifi network name) but cannot access the internet” the set up also fails as it is unable to find Chromecast device. Not sure what went wrong but it was working perfectly on the first day of purchase. I am using Dlink router with 2.4 GHz and for ChromeCast an external power supply and HDMI extender as mentioned in manual. As suggested by the message, your router has no internet connection. Can you access internet from other devices connected to the same router? It’s not necessary to reset the device if you didn’t change settings in the router. Yes, all my other devices are accessing it fine and it is working on them fine, Can it be the IP address? as I recall when I purchased my Android phone it also drops the internet some time and solution was I changed its IP settings from DHCP to Static and than entered IP address, Gateway and DNS servers same as my ISP, but in Chromecast it is not possible to save this data. If other devices can access internet, it is very likely sue to your router settings. Normally, you should use dynamic ip. Most routers allows you to bind ip to specific mac address without setting static ip. Chromecast has no utility to set the static ip. It will use the IP assigned by the router. So, check the settings in your router and check the connected devices. My daughter tried to set up her chromecast at college and wasn’t able to get the cast icon on her apps such as Netflix and Pandora. She just brought it home and I was able to set it up on our home tv. Can you take chromecast from one location to another? If so, how do you change the wireless network? After reset the device, you need go through the setup again top write the new network info the device. Chromecast can only save one network info. If there is no network for Chromecast, Chromecast may advertise itself as an access point. I guess your phone connects to it automatically. But the connection is not functional. BTW, you should change the settings on the phone so that it should not connect to open network automatically. Thanks Simon, does that mean although phone shows connected to wifi, it won’t actually stream to chromecast?, my phone connects to known networks automatically. No, it won’t work. If Chromecast is not connected to internet, it will not work at all even for local contents. You need always notice the message shown on the TV screen. This was so helpful. Thank you!!! Hi I just bought chrome cast. I don’t have WiFi at home but I use my mobile data. Can I still cat stuff off my android phone to my tv using the device? I’ve tried but it keeps saying to check password… What to do!!! It will NOT work. 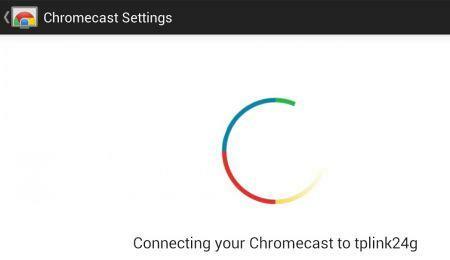 Chromecast requires a wireless router with active internet connection, even for Android screen casting or streaming local contents. This guide assumes both wireless networks are accessible at eh same time so that you can switch. Please note, Chromecast can only save info for one wireless network. CC working sporadically even though only about 40′ from the router. I bought at TP-LINK and put it about 1/2 way between. The CC still does not run continuously. Stopping every few minutes to get the movie again. Solutions? Is it for streaming videos from internet? Did you try it on your mobile devices or PC? I use it from my iPad. Does it matter where I initiatevthe stream from? Simple question…. Just forgot my password!!! How do i change it or access it to change it? Chromecast doesn’t have any passwords. For wifi password, you can find it in the router setup page (under wireless network settings). Different routers may have different setup page. You need check the user manual for your router. I have the problem that in the options for Wi-Fi there is no drop down menu, I can only change Wi-Fi by completely resetting the Chromecast. Did you update your Google play and chromecast app? What happens if you tap the current wifi name? Chromecast was “JUNK” from day one. I purchased two of these worthless devices. I finally gave up and just ordered amazons tv stick. hoping to have better luck plus it’s cheaper. it depends on your purpose. Chromecast and fire TV stick are totally different products. You may refer to this page on the difference between Chromecast and Fore Tv stick. I have reset my chromecast but I can not make it reconize my tv, I changed internet providers and I have changed the modem settings. The display on the tv shows it is connected but when I go to diveces on the app it shows no diveces. Your Chromecast doesn’t need recognize TV. It’s just a TV input. If the TV screen says it’s connected. It should also states which WiFi network it is connected. You mobile device should connect to the same WiFi network. You may also try to update Chromecast app on your mobile device. After an update (Dec 2015) chromecast shows a network name of one of my neighbors routers when I switch on TV. I can’t access chromecast like before from any of my mobile devices. Funny enough, I can see on my router the IP address of my chromecast device. My and the neighbors networks are password protected. How can I switch back to my network? It is strange. You should reset your chromecast. You need use method 1 (hardware button). What app are you using? You should try YouTube app on the phone first. The audio should goes to your TV when casting. think a minute folks: i have a network at home with chromecast hooked up. I move the device to work to use it there – my phone immediately picks up the WORK network. However, your instructions say that BOTH the device and my phone must be on the same network! That NEVER happens unless both networks are in the same location, so I can NEVER change the network on my chormecast. Seems like a really dumb arrangement … unless there is a method you have not explained. In your case, you need reset Chromecast to use it in a new network. Chromecast can only remember one network; your phone can remember many. You can switch networks for Chromecast only if you can access both old and new networks simultaneously. 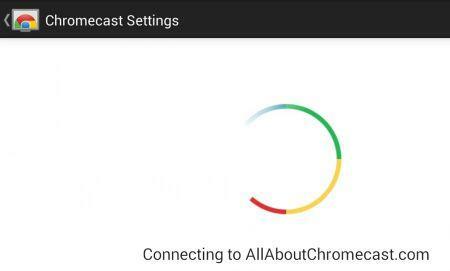 In this case, you connect your phone to the old network (Chromecast connects to it automatically), then you can switch network in Chromecast App in your mobile device, In this way, you change the network info for Chromecast device. Of course, this does not work for you because you cannot access both networks at the same time. We have recently had problems with our internet and the guy came out and added anot her wifi connection, so we have 2 now. We’ll now our chromcast want work it says can’t find a chromcast device. We reset the chromcast nothing works!! What’s shown in the TV screen? If you change the wireless network settings, you need factory reset the Chromecast device. We have did a factory reset many times but still don’t work. The screen says ready to cast from and casting device but when we try to cast our phones say no chromcast device found on network. After you reset the device, it should ask you to set it up again. It should NOT show ready to cast. Are you sure you reset the Chromecast device? The device you used to set up the Chromecast should be able to find it. Did you try to open Chromecast (Google cast) app to check again? Anyway, any devices that connect to the same WiFi network should be able to find it. I’m trying to get the Chromecast to connect to my router via a Netgear N300 wifi extender. The extender is set up correctly as I can see it from my Android with the network name of my router and _EXT suffix. I can also connect to the internet via the extender. When I login to view the Chromecast device info wifi list there is only the main router listed. My Android can see both the main router and extender. Any advice welcome. Problem solved, I shouldn’t have entered the main router login, instead clicked other and then entered extender information. Thanks anyway. Thank you for the update. Enjoy casting. Probably AP isolation is enabled in the router. Chromecast doesn’t support such settings. And you probably should not use Chromecast in such networks. Remember, any devices on the same network can control the device. Thank you for the fast answer. Do you think a solution would be installing a router in my room to create my own network? This network has a captive portal. Is this even possible? If the router can connect to internet (no matter how it does), it should work. You just make sure Chromecast and your mobile devices are connected to this router under your control. There are no workarounds for this because it’s designed to work in this way. I had my router replaced with it can a new wifi name and password. My chrome cast is logged into the old wifi name and password. How do I change my wifi and password so my chrome cast is logged onto my current wifi? 1. set WiFi network name as the old name, with identical password. Chromecast only checks WiFi network name, not actual router. 2. Factory data reset Chromecast. Problem: After new router and clicking the NOW [button[ > Cast, I get “No Cast destination found. Need help?” . My Chromecast was working fine with my old Wi-Fi router. Recently I upgraded my Internet speed with a new AT&T router and a third-party IP. Now my previously installed chromecast2 can no longer be found using chromecast.com/setup. I Reset my Chromecast dongle 4X by holding down the reset button for 30+ seconds until it blinks orange/red. I also disconnected it and done the same. My AT&T router and Chromecast show up on my Smart-TV’s wireless access points and under Input. Under my Smart-TV Input>Chromecast, it reads Welcome. 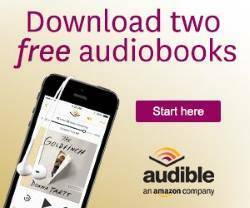 To get started, download the Google Home app on your phone or tablet. I only have a PC with Windows 7. Do I need the Google Home app? Previously I installed directly onto my PC only. I feel my problem is in the AT&T router firewall setting and possibly the DHCP setting which is enabled. I tried to contact AT&T but I don’t have an account with them being that I am with a third party IP. No help there. Any suggestions which your help. Thank you, Russ. BTW: I haven’t been able to update my Chrome Browser for weeks!!!??? I tried everything. When you change the router, you should reset the Chromecast. After reset the Chromecast, you can then set it as a new device. Your TV screen indicates you can even set it up now (reset is only recommended). Google Home app is not required. You can set up a new Chromecast from a PC. If you want to set up or control Chromecast from your phone or tablet (iOS or Android), then you need the Google Home app. While trying to connect my New iPhone to Chromecast and I accidentally deleted the Chromecast device off of the google home app. I can not get it to reconnect. I also think the Chromecast is still connected to my old wifi name which I no longer have access to. Anyway to make this work again? Nevermind! I read the hard reset recommendation and it worked! Thank you! When I try to connect my samsung a3 (2016) to my chromecast it says it cannot connect to the WiFi. On the TV it automatically shows chromecast8769 this is shown on my phone in the WiFi list. When I do the set up and enter other and put in the chromecast8769 it does not connect. I don’t know where I am going wrong so any advice would be appreciated. You need to connect the phone to the WiFi network (not the Chromecast), start Google Home app on the phone, then follow the instructions to set it up. During the setup, the phone will connect to the Chromecast for a while automatically. But you should never manually connect the phone to the Chromecast. You can simply reset Chromecast by holding the only button in Chromecast (when it’s powered). You can then set it as a new one. If the router was changed, you need to reset Chromecast and set it up again. Also, if you open Google home app in your iPhone, it should detect a new Chromecast and ask you whether to set it up. For your case, if Chromecast still can connect to the old network as shown in the TV screen, it means the router was not changed. Hi! You are right. Cablevision guys (provider) changed the Modem to add Fox Series etc (Flow system). I have reset the Chromcast device, downloaded the GoogleApp on my iPhone, but it does not “detect” the device, even after I plugged it as instructed. The “old” screen where Chromcast indicated the old network is gone, and I see [HDM2] only, but the process is interrupted and I cannot cast content on the TV as the iPhone is not detected. Thank you! It’s Google Home app, not Google app. Thank you, Simon. Yes, I meant Google Home app. Still not able to detect my iPhone. is the phone close enough to Chromecast? You can also reboot the phone. In addition, you can try it with an Android phone. “2 or more WiFi networks in the same location (otherwise, why switch? )” because I travel, dipshit. Chromecast is designed for home use. It doesn’t work with many hotel networks.